John Riddell and I attended Day 1 of CILIP’s 2015 conference in Liverpool to lead a master class on how to add value to your organisation as a ‘knowledge facilitator’. It turned out that not only was the concept of value to be a key theme at the conference, but also that of ‘knowledge facilitators’ albeit under different names. R. David Lankes opened the conference with a very enjoyable keynote speech in St George’s concert hall, a splendid venue packed full with the 600 delegates. 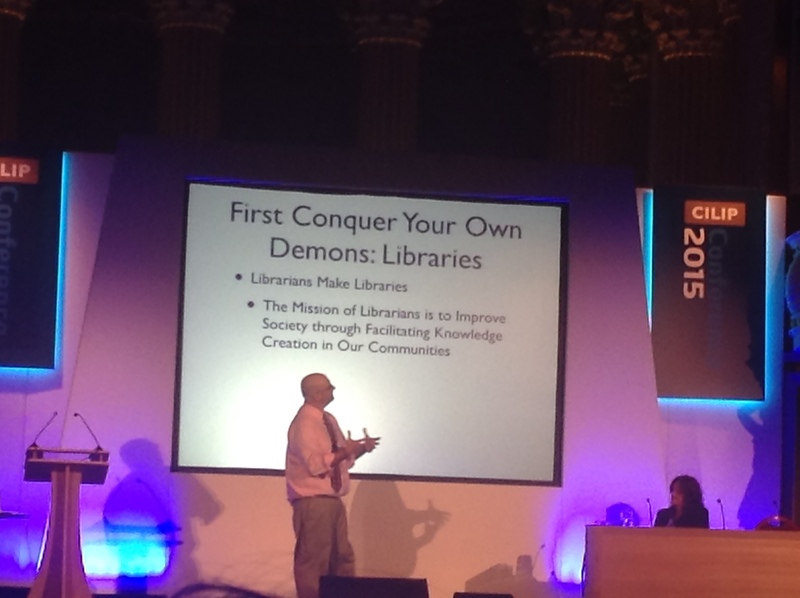 Although David used the generic term ‘librarian’, his messages hold true for all library and information professionals. He also used a variation of the phrase ‘knitters and weavers of knowledge in the community’ – the inspiration for this blog’s title. David set the tone for these important themes that continued throughout the day and culminated, back in the concert hall, with an inspiring presentation from Barbara Schack on Biblioteque Sans Frontiere’s creative Ideas Box approach to providing library and information resources in a different kind of community: that of refugees from wars and disasters. I have witnessed a few variations of human bingo lately so thought I’d introduce one of my own at the start of our master class. 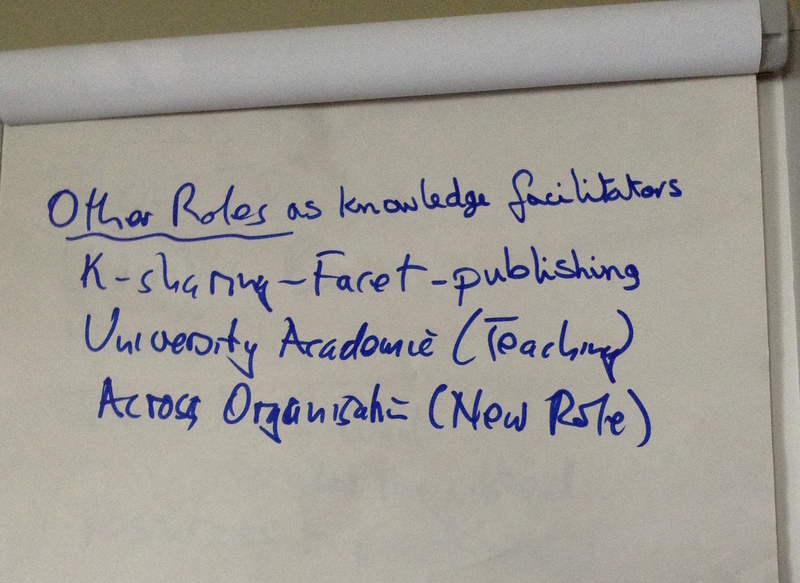 We asked people to stand up if they illustrated one of the examples of knowledge facilitators on our slide. So we had examples of people facilitating information and knowledge sharing on committees, in project teams and on working parties. We captured a few other examples from those still seated. Martin Newman’ presentation on managing records of England’s legally protected heritage reminded me that Records Managers are also an example of knowledge facilitators. Martin has developed his team’s work such that they are moving from a traditionally responsive or reactive approach to one that is more strategic. They will also be crowd sourcing images and additional information from their wide community of those accessing the National Heritage List. Sandra Ward’s historical and forward looking presentation on “Information Management – impossible to ignore?” was also an important reminder of the evolving role of library and information professionals in the context of ‘big data’. I also came across at least one delegate who was now responsible for research data management for projects at her University. I felt like I had come full circle from my first role as a biological data coordinator after completing my MSc in Information Science. Only the complexity and quantity of the data involved is many times greater now than it was then. Knowledge facilitators connect people to people, and people to content. 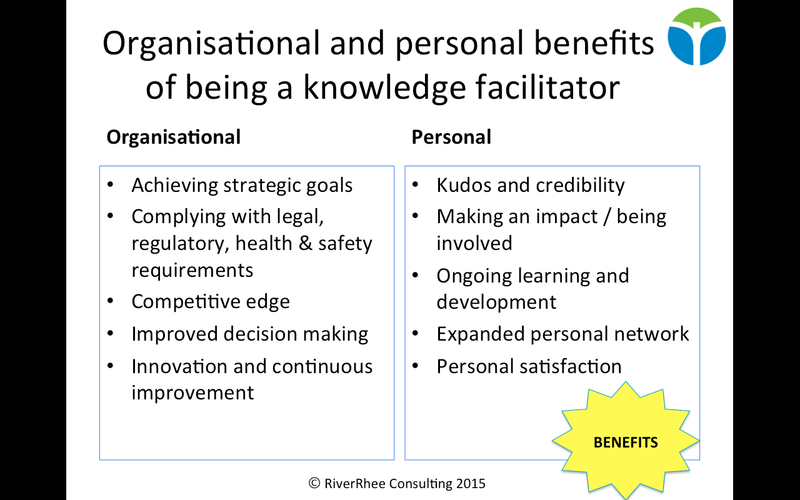 These learnings raise both challenges and opportunities for knowledge facilitators – themes that we came back to in our master class when we suggested that knowledge facilitators created benefits both for the organisation and for themselves. We shared case studies of knowledge facilitators during our master class, some of which reflected examples from the interviewees for our 2014 publication with Gower “Knowledge Management in the Pharmaceutical Industry“. We also referred to Collison and Parcell’s book “Learning to Fly” and their approaches for learning before, during and after. It was good to hear from Stephen Latham in his presentation “Developing knowledge and information management capability in government” that they too use these knowledge learning and sharing techniques. 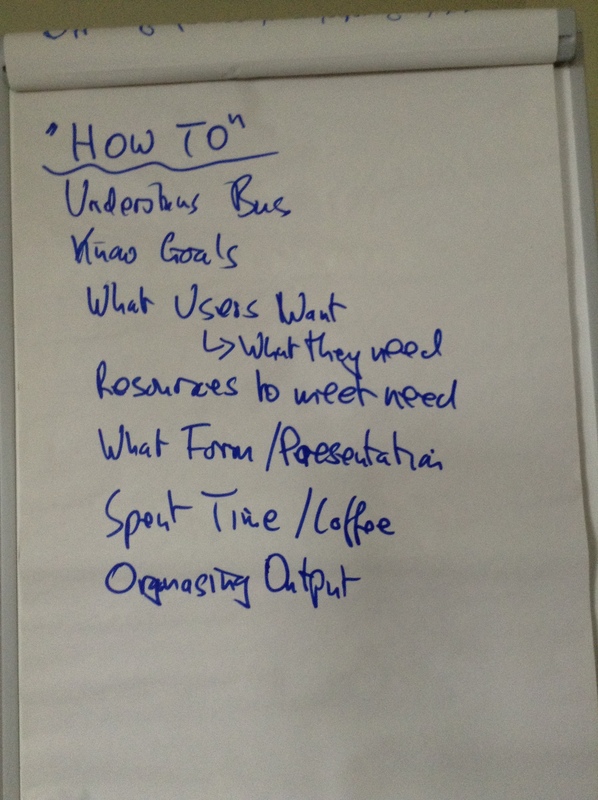 We then challenged our audience to identify ways that they could help knowledge facilitators succeed. We got lots of good suggestions in a relatively short period of time. Some matched our own suggestions, others went beyond them. Denise Carter’s presentation on engaging stakeholders was a great opportunity to reinforce what knowledge facilitators can do to build strong relationships with the members of their communities. I particularly liked her suggestion of taking advantage of the fact that people like to be asked their opinions, by making sure that you go to them with something specific to discuss, and to do this as part of a planned schedule of regular interactions. There was a tremendous amount of food for thought in just Day 1 of the conference for how library and information professionals can add value as knowledge facilitators, and act as “hotspots” (quoting David Lankes again) in their communities. I would be curious to know whether Day 2 continued and expanded on those themes. She is a member of CILIP (Chartered Institute for Library and Information Professionals) for which she delivers various courses including “Fostering effective knowledge sharing and collaboration“. Elisabeth is also a member of APM (Association for Project Management). This entry was posted in Optimising information and knowledge assets and tagged Barbara Schack, CILIP, customer value, David Lankes, Elisabeth Goodman, John Riddell, knowledge management, Martin Newman, R.D.Lankes, Sandra Ward, Stephen Latham. Bookmark the permalink.